There’s a type of book that my readers never seem to tire of; a book based in schools, with issues around friendship, family life, and all the bother of finding one’s place in the world. I am delighted to bring you a new series that does the job so diligently with a clear understanding of 12 year olds, and with writing that sparkles with life. This is just the sort of series I wanted to read when I was young. (I confess I hugely enjoyed reading it this past week and I’m well past childhood!). Lil Chase has created a fictional boys’ school, Hillcrest High, which has decided to admit girls for the first time. 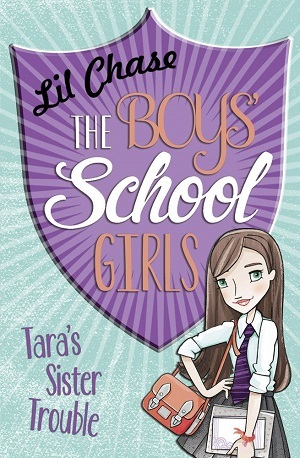 In the first title of the series, Tara’s Sister Trouble, Tara is one of these girls and she’s very excited – not least because she has a huge crush on one of the Hillcrest boys – but also because a new school means new friends, new opportunities and her best friend will be attending too. However, when Tara’s sister also joins the school, things start to fall apart for Tara. There is intense rivalry amongst the few girls at the new school, and her sister seems intent on sabotaging any relationships she does have. It’ll take Tara a fair amount of detective work and understanding to find out what’s really going on with her sister and her friends. There are a few little plot twists in the book – and it deals with some larger issues too – break up of a family, gambling, and jealousy, but Lil Chase always deals with them showing a great deal of compassion and humour. The action rolls along at a good steady pace and the reader is compelled to feel great empathy with the main character. There are three in the series, and the next two each focus on a different girl in the set of friends. Lil Chase has handled this cleverly by writing from the first person perspective each time – but the voices don’t blend into each other. Each girl in the series has a distinct voice and personality and this shines through. It’s a clever device and very enjoyable. The next two are Abby’s Shadow and Obi’s Secrets (the last published June 4th), but I’m hoping there’ll be many more. A series your 9-12yr old will devour with relish. You can buy the titles here from Waterstones or on the Amazon sidebar.